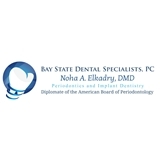 Bay State Dental Specialists, PC (Quincy) - Book Appointment Online! At Bay State Dental Specialists, we know that healthy, beautiful teeth can boost your confidence and give you a sense of well being, that is why we provide comprehensive dental care, specializing in dental implantology, periodontal care and cosmetic and reconstructive dentistry. Our team is dedicated to serve our community by maintaining a high level of care and professionalism.